ONE-THIRD of severe asthma sufferers have been put on a life support machine as the result of an attack. Research found 28% of sufferers have experienced a potentially fatal attack that led to them being put on the life-saving machines. Of those who suffer from the disease, over half live in fear of the next asthma attack, the research conducted by Novartis Pharmaceuticals found. The figures, collated from 333 sufferers, found that two-fifths of people with severe asthma have to visit accident and emergency units at least once a year. 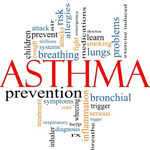 Dr Dinesh Saralaya, consultant respiratory physician at Bradford Teaching Hospitals NHS Foundation Trust, said: "People with severe asthma, whose asthma is not under control or who are experiencing regular attacks, should discuss how to best manage the condition with their doctor. "This is a key goal, since the majority of sufferers feel they can get on with life if their symptoms are controlled adequately."